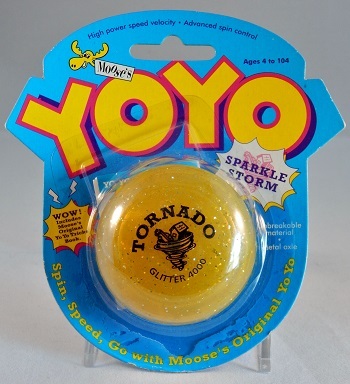 From Moose's Series 1 line, a translucent yellow tournament shaped yo-yo with gold glitter embedded in the halves. Looks similar to the Duncan Gold Award yo-yo. Uses a metal axle and starburst response. Original retail price: $4.50 US.